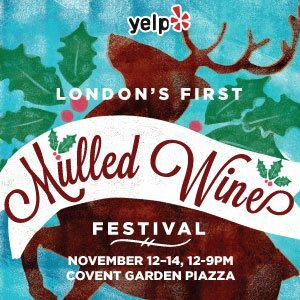 It's the season for mulled wine, and Yelp has organised a 3 day mulled wine festival in Covent Garden to run from Thurs 12th - Sat 14th November. It's free to enter if you check in on the Yelp app on your phone, and charity donations are also encouraged. There will be lots of stalls selling mulled wine, lots of food, and also the frozen cocktail specialists ‘LIC’ will unveil their exciting new Mulled Wine Frozen Cocktail over the three days. Put it in your diary! "There will be three days of mulled wine from some of the best spots for mulled wine in the city. Plus mulled cider! And mulled mead! And mulled ice cream, mulled pops, mulled candy, mulled jelly shots and, of course, Christmas pies! (And also, some seriously amazing other eats). It starts on November 12, the same night as Covent Garden switches on its new Christmas lights. Designed by celebrated fashion and film production designer, Michael Howells, the new scheme takes inspiration from the mythology of mistletoe and Covent Garden's world-renowned reputation as a special place to meet friends, family and loved ones. The iconic, 22 feet tall silver reindeer will also be returning to the East Piazza, ensuring this year's switch on moment will once again have a stunning backdrop. Contemporary acapella group After Party will be entertaining the crowds with an exclusive set from 6pm, which features everything from Taylor Swift to Christmas classics. And, whatever the weather, you're guaranteed a white Christmas in Covent Garden as it will snow on switch on night to add that extra touch of magic."